Fall. Comfort food. It is time. 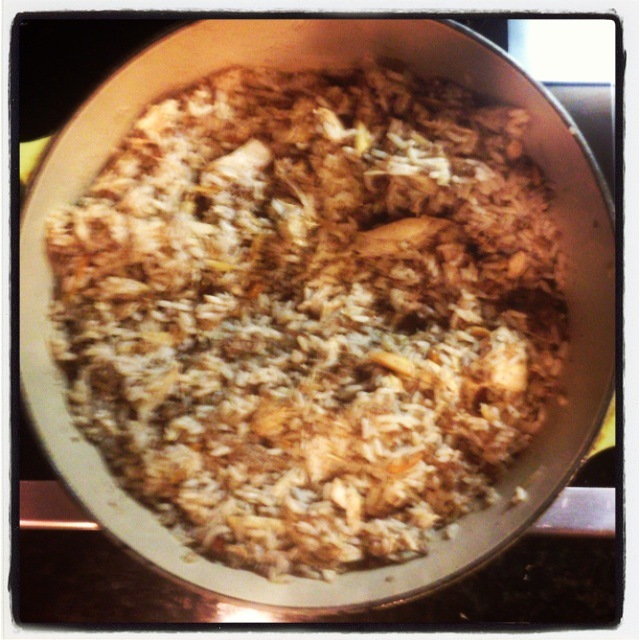 This particular dish is an imperfect version of a delicious original Lebanese Chicken and Rice dish that got me through two rough periods of morning sickness cooked by a friend’s mother who probably thought I would starve to death during my last pregnancy. Because I need this dinner for myself and people I care about more than once a year when Mrs. Nammour visits this country, I came up with this version that in no way compares to hers, but still hits the spot–pregnant or not. In fact, it is so good, so wonderfully healing and comforting, I named my daughter after her. 1.) Strip chicken from bones, discard skin. Chop or shred into bite-size pieces. 2.) In small saucepan, heat chicken stock. 3.) In a large pot, heat a small amount of olive oil over medium-high heat. Cook onion and ground beef until no longer pink. Add garlic. 5.) Add hot chicken stock, stir to combine, and then turn down heat to simmer. Cook about 20 minutes–checking occasionally–until rice is cooked and stock is absorbed. 6.) Add the chicken and nuts and simmer a few minutes longer. This one pot meal is perfect to bring to a sick friend, a starving pregnant woman, or anyone in need of food for the soul.